In the ninth encounter with the Estonians, Croatia national football team had to admit defeat for the first time. A. Le Coq Arena, Tallinn. Estonia: Aksalu (46' Meerits), Toomet (76' Vassiljev), Anier (70' Zenjov), Käit, Klavan, Luts, Mets, Kallaste, Dmitrijev (86' Antonov), Baranov, Teniste (86' Mööt). Head coach: M. Reim. Croatia: L. Kalinić, Lešković, Mitrović, Vida (84' Jedvaj), Bradarić (58' Badelj), Rog (58' Pivarić), Kovačić, Pjaca (66' Ćorić), Perišić, Kramarić, Čop. Head coach: A. Čačić. Following the successful 2018 FIFA World Cup qualifier against Ukraine on Friday, Ante Čačić's men visited Tallinn to play a friendly international against the host Estonia. Croatia was without the injured duo Ćorluka and Vrsaljko, while Subašić, Modrić, Rakitić, Mandžukić, N. Kalinić, and Brozović have already rejoined their respective clubs. Head coach Čačić has therefore decided to try a couple of players with less minutes in the national jersey. It took only 57 seconds for Estonia to score: Luts finished off his breakthrough beating L. Kalinić to make it 1:0. Searching for an equalizer, Vida tried a header, Pjaca a low shot, both Estonia goalkeeper Aksalu was well positioned. On 31 minutes, Aksalu saved a quality header from Čop, and ten minutes later captain Perišić's powerful strike found the outside of the net. Estonia came close to doubling the lead in 41st minute, when L. Kalinić saved an excellent opportunity from Toomet, and Lešković replied in the dying seconds of the half, with Aksalu saving his team once again. In the second half, it was Čop who tried first, but on 64 minutes Pjaca was forced off with an injury. Kramarić later tried a shot from distance, but the Estonians managed to score again. On 81 minutes, Vassiljev found the bottom corner to double the lead, and three minutes later he assisted Zenjov, who made it 3:0. Croatia plays its next match on 27 May, a Los Angeles friendly against Mexico. On Tuesday, Croatia meets Estonia in a friendly international in Tallinn, with head coach Ante Čačić using the opportunity to test his options for the remaining European Qualifiers. 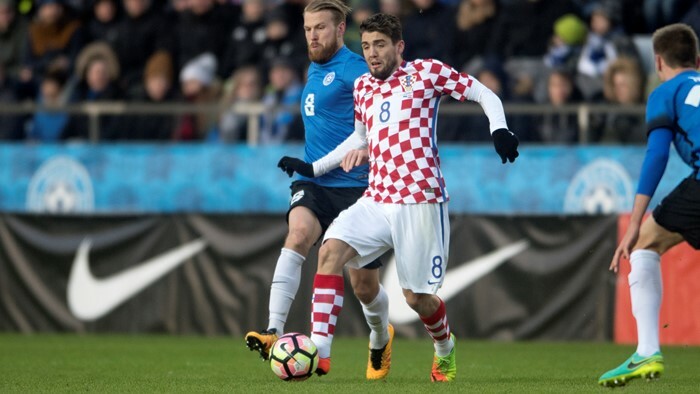 Croatia travelled to Estonia without the injured Ćorluka and Vrsaljko, while head coach Ante Čačić allowed Subašić, Modrić, Rakitić, Mandžukić, N. Kalinić and Brozović to return to their clubs. Youngster Ante Ćorić joined the squad, and Čačić expects another quality performance of his team. "This is an opportunity for all the players to confirm they were called-up for a good reason and that they are a part of the national team. They can all contribute - as they did before - and I expect Croatia to present motivation, responsibility, and discipline, searching for a positive result in the process", he said. "I hope my players have rested following the Ukraine encounter, and I like to play these friendlies. They can provide many answers, if we ask the right questions. We can prepare the team for the rest of the qualifying. Estonia is a tough nut to crack when playing at home, even Croatia had a rough time here. However, we will give our best, focusing on our own capabilities, knowing that playing Croatia is a significant motivation for anyone. I want my players to respond at a maximum level", added Čačić. Inter winger Ivan Perišić will take over the captain's armband for the night. "It was difficult for me not to play against Ukraine, I really wanted to, but now we turn to Estonia with me leading the national team as the captain. No one is more proud than me, I can hardly wait. I am convinced that this team is strong, that we can replace the missing players, and that all of us will play at 100 percent", said Perišić.